AMD has been tanking last 6 months since maxwell, because its a much better architecture. and their lack of decent CPU, is now showing just how bad things are for AMD. they need to bring the 390X out in a months time. they need to start hyping, and showing it off, and kick start production. people are saying June release. That is too late. I dont think AMD will have enough cash to stay open. as you can see for the first time in a long time their operating income is in the negative. That means Hemorrhaging CASH. AMD has certainly enough cash to stay afloat till June. They have some 900m cash+liquid securities (debt is $2.3bn, but of that only $235m short-term part), so they can afford to bleed a little bit. But they should slow down the rate nevertheless. Yeah not premature at all, the results clearly show AMD has not been competitive in the marketplace the last few quarters since Nvidia launched their Maxwell-based GTX 970/980 parts. Not only was AMD forced to slash prices on their most relevant, highest margin SKUs (290/X), market indicators and AMD's own results show they still aren't selling enough GPUs. What used to be a segment that consistently turned a profit for them despite losses in the Compute segment, the GPU segment is now being cited as part of the reason this segment is posting losses and declining revenue. Last quarter AMD fell to a 76/24 minority share to Nvidia in the dGPU market, that's the biggest the gap has ever been since Nvidia's dominant share during the time of G80/G92 when AMD didn't have a competitive part and R600 was late. These results all but confirm more of the same in Q1 for AMD. 80% marketshare for Nvidia is not unrealistic. To put that into perspective, that is Intel levels of dominance. exactly. I work for PC parts company, and no one is buying AMD high end. its stupid to. the GTX 9 series is on par or better and half the power usage almost. amd are just selling low end GFX for budget desktops etc. and Nvidia is dominating enthusiast segment in every caliber of performance. When I told Roy the VP of IP. all he had to say was. "that's interesting" surely he didnt know that. 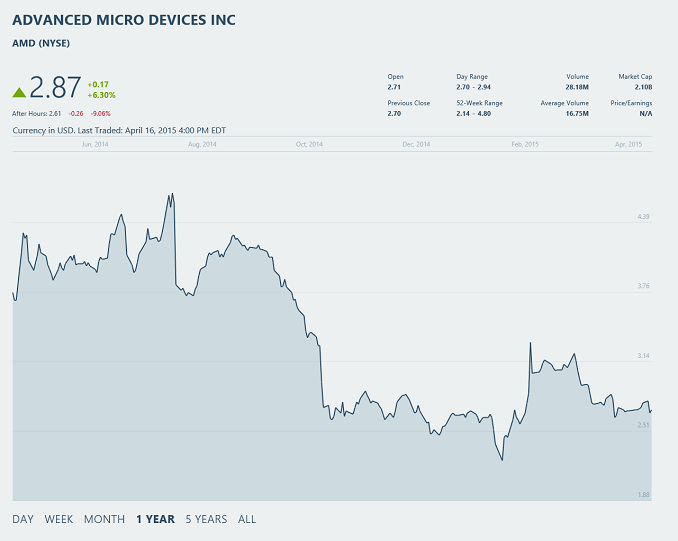 AMD is in bad shape. And as you said the GTX 9 series is only going to sell more. and I am one of them. I was waiting for R9 300 news, and this close to release NOTHING. means card is late or not going to be made. At anandtechs chart total system consumption of 970 was 300w, vs 370 on comparable AMD.